Evergreen, IV2 to 2V2 ft. (45 to 75 cm). Zones 5 to 8. Dimorphic. description: The rhizome is erect. Horizontal whorls of evergreen, oblanceolate, sterile fronds are once-pinnate with 40 or more pairs of pinnae that are greatly reduced at the base. 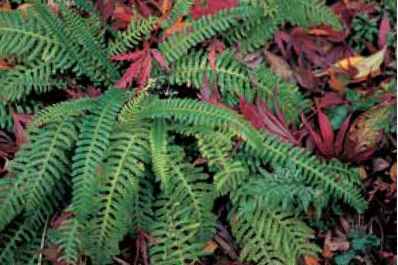 The purplish-brown grooved stipes are one-sixth or less of the frond length. Deciduous fertile fronds, with grooved shiny ebony stipes of up to one-half of the frond length, are taller and upright, waving to the breeze to insure the dispersal of their spores. Narrow, linear pinnae fully enclose the sori and indusia. 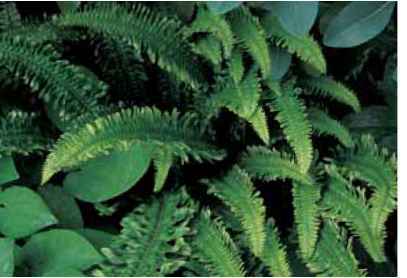 Blechnum penna-marina as typically seen in cultivation. variable and dependent on moisture and depth of soil and shade. 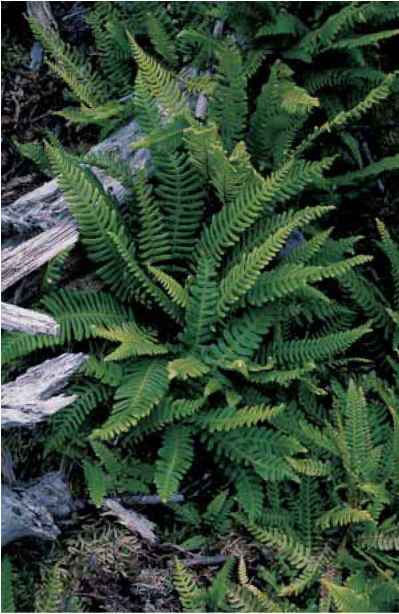 Moran (2004) observes that fern prothalli are most likely to be found on disturbed soils. 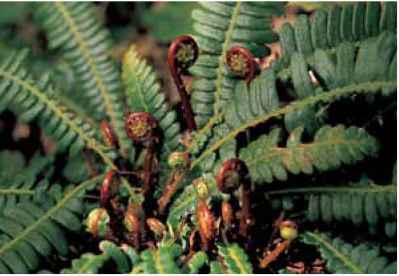 For me the deer fern provides the archetypical example and is, in fact, the only species where I have seen prothalli in nature. They were clustered in the dark, on the remains of recently uprooted tree underbellies in a site clearly defined as disturbed in the olympic National Park in Washington State. Blechnum spicant in the woodlands of the Olympic National Park in Washington State. Unfurling fronds on Blechnum spicant'Imbricatum'. associates naturally with such delights as bunchberry (Cornus canadensis), oak fern (Gymnocarpium), and twinflower, (Lin-naea borealis). It is especially dominant around Lake Quinault in the Olympic National Park where the Roosevelt elk are reputed to prefer a diet of the deer fern's competitor and companion, Polystichum munitum, the sword fern. 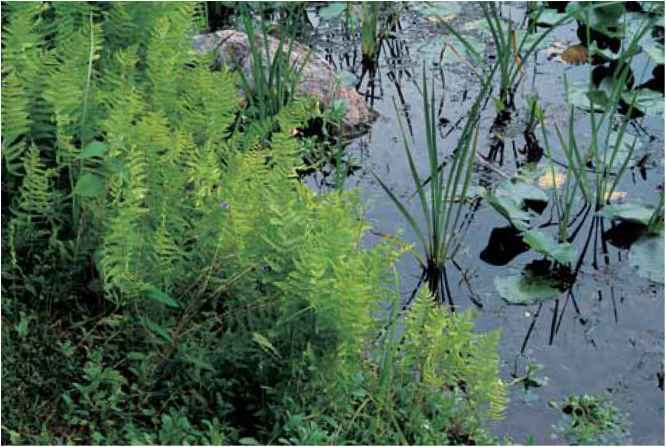 Thus relieved as a menu item, the deer fern dominates the forest understory, where it serves beautifully in 12-month splendor. In eastern and southwestern U.S. sites, away from its native habitats, it is not always easily established. Spring planting is recommended as well as dutiful respect for its spongy acid soil demands. 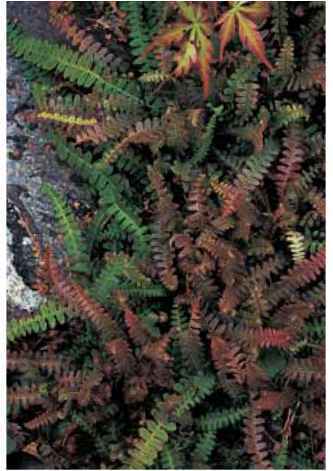 Just under a century ago British literature (Lowe 1908) described 83 Blechnum spicant cultivars. Most have not survived, but horticulture still enjoys a number. They include 'Crispum' with undulate pinnae margins; 'Cristatum' bearing fronds with crests at the apex; 'Imbricatum', a small form with overlapping pinnae; 'Incisum' with cut pinnae edges; and from a 1972 discovery, 'Rickard's Serrate', which has neatly scalloped pinnae margins. The latter two are almost identical. While fern populations in the United States, especially in the west, are not prone to sport (produce cultivars), Blechnum spicant will surprise, or at least tease, the observant naturalist strolling along the trail with an occasional plant with bifid (forked-tipped) fronds.